I was getting crabby...who me???????? a canvas heart that I picked up while shopping on Saturday @ For Keeps Sake. It's made by canvas corp.
this is good...if I say so myself...ha! It's so simple...duh...why didn't I think of that before??? So the moral of the story today? that must be why it's called mixed media art! ***NEWS FLASH*** FILM STRIP update @ the end of the post! it was our cruise shipping deadline. Our kits...supplies...and marketplace goodies all needed to be @ Fed-Ex to be sent to Tim & Mario for loading on the pallettes, which will then be sent to the ship...soon! At last count...Mario said we have 7 pallettes of CRUISE STUFF! One BIG thing checked off the TO-DO list here! there's still about 333 left! snaps should be MATCHED. That's the rule. It was an ABSOLUTELY.........AWESOME day!!! Road construction or getting to the store to teach & SHOP? Anyway...I remembered that I did have my camera...and got a shot of this pooch. Click to see the little cutie, riding in a sidecar with his goggles. I got to For Keeps Sake on time...yippee! THANK YOU MISSY...how freakin cool!! I didn't get a photo...maybe she'll send me one! You need to see it! AWESOME!!! Before the workshop, I signed my book for lots of shoppers! And then they shopped...and I shopped too! & I got to make some new ones too. It's fun to share the day with people who GET IT! THANKS to everyone who got inky with me. a 7 hour drive! YIKES! THANK YOU GUYS! Thanks to Sue for being my TA...I appreciated the help! Thanks to Ted & Michelle for bringing rubber heaven to St. Louis! You 2 are THE BEST friends & business partners EVER!! I said..."do you think he likes Miller light or Bud?" Do you want to be thrown out of town?" I LOVEEEEEEEE NOODLES...oh & cosmos! I had...one for therapeutic purposes only...cosmo, that is. Got to the hotel about 10:30 & crashed. Cool...they can be FLOWER CENTERS! a 10 minute project...glued to a vintage fruit basket...DONE! 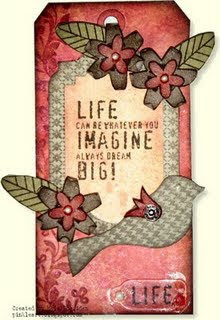 I want to use it on a couple of the "just dream" wall hangings like we did in the workshop. I want to do a project with index prints (like tim did) for my nephew's pictures, I have an idea for a card using the house mouse stamp where he is behind the camera and the filmstrip ribbon will be perfect for that! I know I already ordered some, but I don't think I have enough to wrap around my house yet! lol Wish I could go to st louis this weekend or on the cruise with you in october! 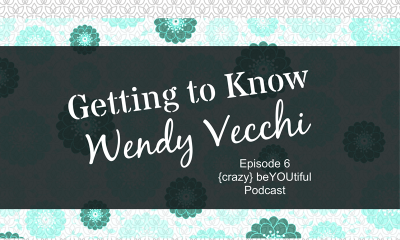 Keep making art, Wendy, your art inspires mine! 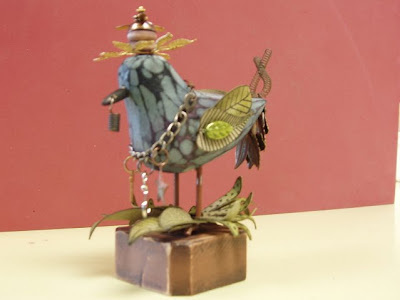 Probably the most important thing I learned from one of Wendy's classes at StampFest in Orlando, Florida was to take ordinary objects and incorporate them in unexpected and delightful ways. I'm sure there will be many creative ways to use the filmstrip ribbon other than the obvious. please send me your address & I'll get the cute tins in the mail to you. UPDATE!! I got spoke with Daisy and eclecticPaperie just got another shipment of film strip ribbon in this morning...I'm just sayin...happy shopping! Just sitting waiting for me to have a little time to experiment! I get to see my friends again! YIPPEE! YIKES...I better get there REALLY early! and MILLIONS of fresh rubber stamps...all in one place! they're coming all the way from Oklahoma for some shopping & the grunge workshop. HOW COOL!! Simple...the comment is your entry ticket. The winner will be chosen...(or winners???) @ 7am on Monday. 1440 snaps to be exact! and checked OFF the TO-DO list! This is the progress we've made since 5am...today. If you don't...look what could happen! I'm not sure who the culprit was...UPS, USPS or Fed-Ex...but it's been tracked and is finally there. so...we'll be kitting...kitting and kitting cruise stuff! OMG! I was sooooooooooooooooooooooo excited. I said YIPPEE about 12 times! Hey! What are friends for? Anyway...Daisy said the film strip ribbon has finally arrived. perfect fit...one mini photo under each frame. eyeglasses for my art chick! use it vertically or horizonally. they are finally in stock too. These are blank adhesive sheets so you can cut your own masks & stencils. what a simple idea...but pure genius! This ART blew me away. acrylic binder for studio 490 stamps. LOVE the color...LOVE the design! waiting to be stamped for.........?????????????? ps...we'll get back to the Q&A's (AC)...I'm keeping a list of them! 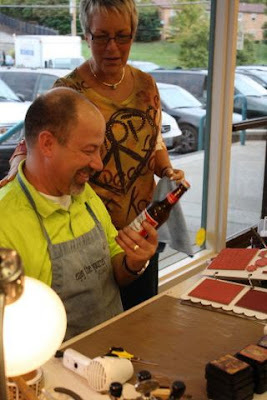 We had a BLAST @ Prairie Art Stamps in Springfield, Illinois on Saturday. LOTS of new art friends. THANKS Terri for the invite & to everyone who came & played. but I will tell you that Rick said...what the heck is this for??? the 12 remaining colors of the Distress Stickles!! and another BEAUTY by Hel's! Hmmmm...What else do I have to say??? So far we've sent them all over the US, Canada, LOTS to the UK, the Netherlands, Spain, Italy and today's mailing goes all the way to Japan. For Keeps Sake in St. Louis...this Saturday. and then a grungy workshop after that. Ribbon? Wow... filmstrip ribbon along with your new book (which when it arrived on Wednesday got read and re-read, so no dinner! )would lead to a whole new set of ideas! 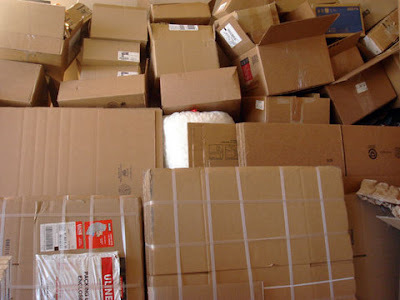 boxes, containers & a giveaway! since each pack contains 50! that's NOT exactly what Rick said...ha! I could wrap this whole house & make it look like a giant present. but that adorable tin sure is a PERFECT fit! 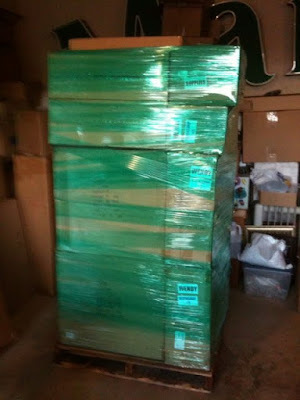 40 packages of film strip ribbon??? Want some? I got PLENTY to share! I'll be back Monday morning @ 7am...so get your comment in before then. If you don't win...it will be in stock here soon! I just wanted to pop in for a quickie HI, so you'll KNOW I'm thinking of my blog friends. Here's a FLEA FINDS from few weeks ago. I have a THING for shoes...even if I can't WEAR them. And who doesn't NEED a shoe sizer? I obviously did! and eventually kitting & shipping. The deadline is getting closer!!!!!!!!!! Make that a FEW tables for 30. What a GREAT day & a GREAT class with 30 GREAT friends!! THANK YOU Scrapbook Friend'z for the FUN day. A HUGE thank you to Linda Broom...for being the PERFECT TA. You thought I was kidding about hiring you...not so. Say adios to State Farm & come HELP me! A NEW store in Springfield, Illinois...called Prairie Art Stamps. one is THE BIRD class...one is the grunge hanging. And the "counter for one" part of the title? This whole question and answer thing is so much fun!!! I have a quick question (I hope it's quick for you since you are soooo busy). I'm wondering how Claudine's medium compares to Golden's... I have several of Golden's mediums including Matte Medium that I should probably finish before getting something different... but???? "my multi medium is comparable to Golden quality-wise but it has it's own creamy consistency that you can't find elsewhere so it lends itself to gluing paper a little easier as well as small objects!!" So...there you have it...right from Claudine. I really like it...it holds even heavy objects...VERY WELL. I like it for sealing art too, because when dry, it's not tacky feeling like mod-podge....or should I say brand X? since the magazine didn't show us enough pics of your studio can you show us more? I want to see it all. but I'm NOT going to fall for that & show any cruise stuff! ha! I like numbers...maybe that's why? When I first started stamping, I thought if I ever made art to sell...that would be a good name. studio 490 just developed & I like that better. It's me again. Sharon said she loved you & you're coming back to Buffalo. WHEN? I was oot last time & i don't want to miss out again. I will be back in Buffalo for sure. I LOVE Sharon, Mark & Jess too, but no date has been set yet. I'm working on my schedule for next year, but I won't have it finished until the end of the year, or possibly the beginning of next year. I do try to keep my teaching schedule current. Just check the sidebar on the blog for updates. I know you do lots of mini albums for Maya Road. What's the best/easiest way to cover the pages? Yours look finished/professional, I don't think mine do. I adhere the paper to the chipboard...run a brayer over it to really get a good bond. Then I'll trim off the excess paper with a craft knife & then distress the edges with Tim's sanding grip. To finish it off, I'll ink the edges with the distress inks for a vintage look. We watch very little TV, but friends got us hooked on America's Got Talent. ps...I DID believe that all things were possible, but the BEARS ruined that thought. Adhering patterned paper to grungepaper was NOT my original idea. and keychain made paper covered giant roses, that she hand cut. So...for those who sent emails...I am NOT the genius...they are! to make the roses shown above and the inked/stamped versions I've showed in previous posts. OK....tell me how to get the paper on the flower so the paper fits the stamp. geez. I stamped the rose on grungepaper & roughly cut it out...see below. Then adhered it to the BACK of the Jenni mini papers, with my stamped image facing UP. Now, when you cut, it's a perfect fit. BUT... I did put paper scraps on the single petal & 2 petals that make the rose center. Since the petals are bent down, you really don't see much of the underside. The original rose making post is here. It's got all the instructions and some step by step photos. 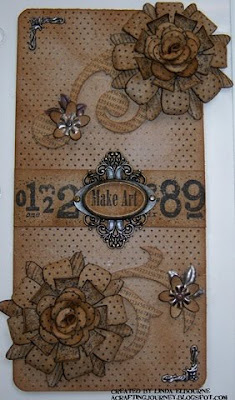 What glue do you use to glue paper to the grungepaper like you did for the roses using Jenni Bowlin's mini papers? The 2 glues I use are Claudine Hellmuth's multi medium...the matte finish and I also like Art Glitter Glue. I would like to see a TIPS section in your next book which would be answers to all our questions. What do you think? 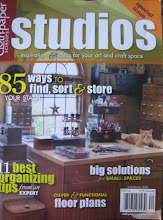 I do have several pages with LOTS of tips, hints and my FAVORITE products listed in this book. If I think of more, you bet I'll include them. I have a question...When ordering one of your stamp sets, do they come on the scalloped plastic page or do I need to order that separate? The studio 490 stamps come on the scalloped storage sheet. You don't need to buy them individually. My question is this: You mentioned that Ted brings your stamps to conventions. Will he be bringing your book as well? 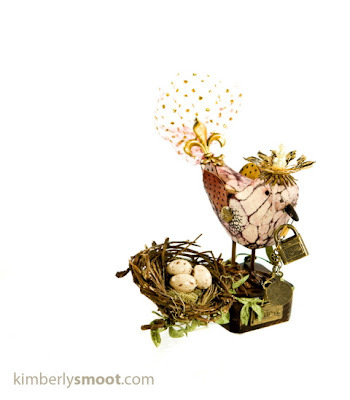 Next weekend I'll be attending the Stamp Scrap Art Tour in Rhinebeck, NY and I see that Stampers Anonymous will be attending. LUCKY YOU...to have a convention close! Yes...Ted will be there with a TON of stamps and my book too. He does GREAT demoes & is a very funny guy. You'll have a great time in the booth. Tell him I said "HI!" Ask him if he can make a GRUNGE flower! We got a BOATLOAD (get it?) to do. The cruise leaves a month from today...BUT...my "stuff" has to be completed & shipped to Tim by 2 weeks from today. ps...please take a moment today to remember the families affected by the tragedy of 9/11/2001. Hi Wendy...love, love, love your binder covers! On the second one, is the center of the flower on the lower right side a wooden button? It looks very interesting! I took a closeup to show it better. It's a vintage game piece...maybe an old checker?? ANYTHING can be a flower part! I LOVED the binder ideas and the helpful tips. I see the number vol 2 & the 3 is hidden in the flower, but I can not find the 1 on the first. IS it hiddeen for a reason? You guys are too observant. There is no number 1 on the first binder, because if the stamps didn't sell, there wouldn't have been more releases. I guess I didn't want to jinx myself! ha! This one is made by Timi Taylor, one of the owners of For Keeps Sake, in St. Louis. they have a FUN weekend planned for you...Sept. 26 & 27th. NUTS...I know...but I REALLY do LOVE stamps! 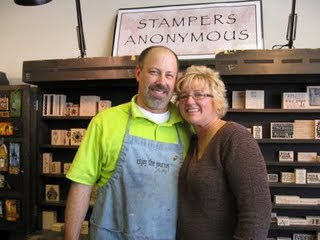 The workshop is sold out, but you can come & SHOP for stamps! These are all FABULOUS! I know you stated it somewhere, but how much is your book again? I'll have to save some $$ for it. International shipping is $10-$12...depending on the destination. have you done roses in any other color besides blue? i'm thinking about red or maybe orange? I LOVE the mini papers because the patterns are small & PERFECT for making flowers. The paper is adhered to grungepaper. I think I forgot to take photos before sending them out...but I did like how both colors turned out. NOPE! My lips are sealed...We want you to be surprised. I'll be surprised too...since I still don't have my stuff decided yet! It's on that giant TO-DO list I mentioned yesterday...YIKES! I have no time to SHOP! Which explains why you've not seen any new shoes lately! You answered a question about the floral wire and wrap with the following: "Cloth covered wire is perfect. I have it in both green & brown. It's available @ JoAnn's, Hobby Lobby & Michaels (in the floral section)...but I've only found the brown @ JoAnn's in our area. "Ok - what's "our area"?? 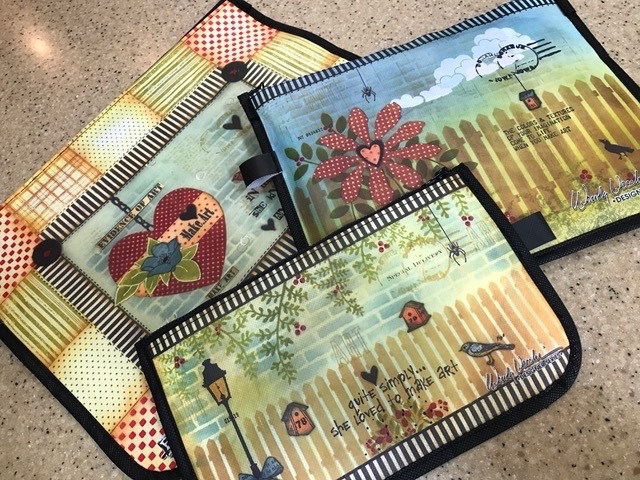 Are your stamp sets sold in Joann's? I've never seen any of the good stuff in our Joann's!!!! Sorry, Joann......no offense! NOPE...my stamps are NOT sold in JoAnn's. 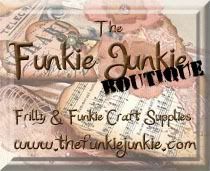 They're only available thru your LSS, on line @ eclecticPaperie & other on line stores or directly from Stampers Anonymous. If you're lucky enough to have access to a convention featuring Stampers Anonymous, Ted has them there too. MY LSS is 75 miles away...ONE WAY! I'm happy to drive there SATURDAY to see my friends, do a book signing & teach a FULL grunge workshop! YIPPEE! Just found your blog. How long does it take you to do a project? It takes me forever and they dont compare to yours. I'm VERY slow, which is not a good thing when you have a 999 item TO-DO list. It's rare that I can get a project done quickly. a Maya Road CHA project, can take me all week...like 25-30 hours, to get it to the point where I'm satisfied. Even a simple card can take me several hours. I FORGOT to include them in the book. The acrylic storage binders are available here , LSS's and directly thru Stampers Anonymous, click on Accessories & then the category is...STORAGE. hello...I picked up my binder @ the convention ...now what? where do I start so the glue goesn't show? I'll choose the paper I want to use, cut it to the size I want & lay it under the front cover....but NOT use any adhesive yet. Then...I'll embellish the front and adhere everything onto the front. Then, turn the cover over & you can see exactly where to place the adhesive to hide it. Any place that has an embellishment will get some adhesive, to hold the paper in place. Depending on the paper you choose, you may want to glue 2 papers together & then cut them for a perfect fit, if your paper isn't double sided. It's fun to stitch them together too, like I did on this first one. On the binder below...I also stamped the cover. I used jet black archival & heat set it. It's been shipped all over the country & it's held up very well. Depending on the stamp you choose, you could also stamp INSIDE the cover to protect it even more. This paper is from K & Co. The embellishments are made from grungeboard & grungepaper. The ink colors are peeled paint, brushed corduroy, vintage photo and mustard seed... with a little bit of one of the browns over it. The large scroll is grungeboard from this set. The ink colors are brushed corduroy and broken china. The flowers are all grungepaper. The scroll is grungeboard, already die cut. If you have the binders...I hope this info helps. SHOW us what yours look like! Thanks so much for all your wonderful comments & emails about my book. You have made us VERY HAPPY! we'll give away a book...sometime...randomly! I REALLY NEED TO MAKE SOME ROSES FOR A WEDDING...HELP! Here's the recent rose tutorial...have FUN! I don't have to lie! Believe me... I do have brain dead days. I HATE it and it's inconvenient...but there's no forcing art. Visiting flea markets and antique malls is very inspiring for me. WHY it works? I really don't know...but it usually does. 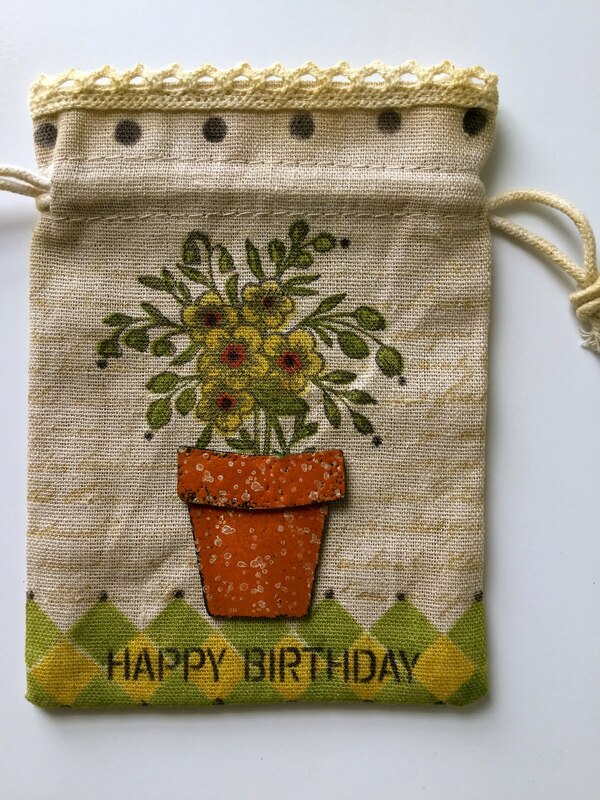 My question: Will you have projects for the fall season using sticky back canvas? I just got some and am dying to find a "Halloween or Fall" themed project to use it on! 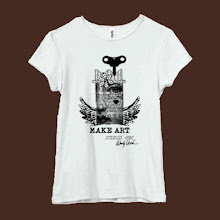 "make art" seems to be your signature. it's so simple. where did you get the idea? YIKES! I was hoping this wouldn't come up. The first time I was asked to sign something I was SHOCKED. and...she wanted me to sign a cool Tim apron, which made it even worse. *if you ruin it SHE'LL be REALLY upset...and it will be all over the net that YOU ruined her apron. God forbid! write something short...VERY SHORT and there's less chance of UGLY. 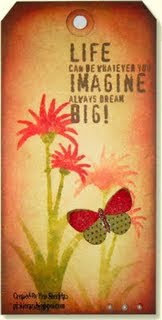 I've always liked the word ART...that's one stamp I collect...if it has ART on it, I'll buy it! So, I wrote "make art" & signed my name...and didn't ruin her apron. YIPPEE! I thought about it on the way home...liked it, because that's what I do...so it kind of stuck. More Q&A tomorrow...you guys sent a huge list! THANKS! We're in FULL CRUISE MODE!!! Tim & I are over the top excited and counting the sleeps! studio 490 sightings...thanks to my ROVING REPORTER! It's my acrylic storage binder...MAGNIFICENTLY done and LOADED with my stamps. Lucky for Linda, that I can't drive over to the UK & swipe this beauty. I LOVE IT!!! Love the colors...love the design. I thought using the mini flower for a wing on the bird was pure...GENIUS. Or, as they say in the UK... simply BRILLIANT! This has great colors...& I LOVE the stamp choices! I too enjoy reading the Q & A's. You have a great sense of humor. Thanks for the chance at a great give away. I got my book yesterday. I've been crazy busy so I only had a chance to glance at it so far but I can already tell that it's wonderful. Without a doubt I will be buying book #2 when it comes out. Send me your address & I'll get your goodies in the mail. I hope you'll use them...MAKE some ART...and show us what you made! I'll be happy to post it here. It makes my blogging easy...THANKS! Anyway, I do have a question today. What color of distress ink was used on the flower in your very cool antique film frame? I used my new fav distress ink..brushed corduroy for the flower in the previous post. I REALLY love vintage photo with the faded jeans distress ink. Try combining them for a background. They make an awesome custom (teal-ish)color! I love when you answer questions!! The answers are always a hoot! Hilarious post... maybe Jay Leno needs you on his new show! DON'T give up your day job!! Can you stack 3 tool holders or only 2? You sure can stack 3 craft spinners & have all 24 blending tools out & READY for action. i got my book today!!!!!!!!!!!!! love it lots!!! can't wait 'til Sunday...my day off. are you really doing another already or was that another teaser? i'm never sure with you. THANKS SO MUCH!! We are beyond thrilled with how well it's been received. THANKS SOOOOOOOOOOOOO much for all the wonderful emails & comments. Like I said...we're very happy! What do you use for stems that will be free standing. I want to make a flower for my friend's vase in her VW Beetle. (in the floral section)...but I've only found the brown @ JoAnn's in our area. It comes in several different gauges...large flowers need the heavier wire and mini flowers can use the lighter weight. Hmmm...is that the new Rock candy Crackle paint? How about some memory frames & capsules? @ 7am on Tuesday, Random.org will draw the winner and I'll post the winner after that. new Ranger pigments & pearls video!